There was an error with your submission, please correct them below. We’ll sent you an email confirming your signup shortly. For now, lets get you logged in. 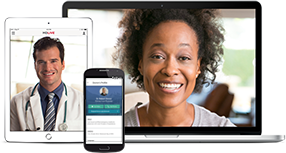 Ascension care sites throughout Michigan have introduced a new care platform that allows a virtual visit on your tablet, phone, or computer when urgent needs arise and your provider or therapist is not available. Our team of board-certified doctors and licensed therapists provides consultation, diagnosis, and treatment through video chat or over the phone 24/7 without an appointment. Follow-up care can take place with your physician. Register and activate your free account online. Don’t wait until you’re sick. Complete your medical history profile during activation. Request On-Demand visit for a time that works for you. In the middle of the night, on a holiday, or in the middle of a packed work week, On-Demand care is available when you need it. On-Demand care providers can diagnose, recommend treatment and prescribe medication. On-Demand care eliminates the need to travel and brings the care to you. Simply call the toll-free number or use the video camera on your laptop, tablet or smartphone for a face-to-face consultation. On-Demand medical care is provided by physicians, who are board-certified in family medicine, internal medicine, emergency medicine, and pediatrics. The cost of a medical visit is $49 or less and the cost for a counseling session is $99 or less, depending on your insurance. That’s much less than a trip to the ER in the middle of the night and more convenient. Please check with your insurance company to see if On-Demand Care is covered.